Catherine Phiri has lost her WBC World female bantamweight title. Catherine on Sunday lost to Mexican Mariana Trejo in Mexico City on split points decision. 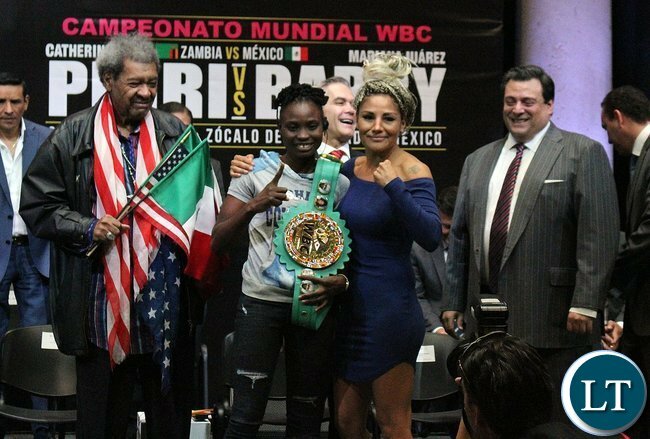 There was not to be a case of lightening striking twice in Mexico for Catherine where she won the WBC title in January, 2016 following a technical knockout victory over Yazmin Rivas. The defeat is Catherine’s second of her 13 fight career since losing to Christina McMahon two fights ago in May, 2015 in Lusaka on points. Ya let’s hope the purse money is good, for her to use in her later years for medical bills, those blows to you head are fatal she should have asked Muhammad Ali. Can’t be on Sunday, what time, should be Saturday. She can loose, no publicity, only stories we hear are about PF. The Queen never leaves her throne! It was a tactical mistake for the Zambia team to agree to fight in Mexico. I am sure the new Champ will avoid Cathy at all costs. My review of the fight is that she was robbed. Mariana was battered and bloodied and worn-out. It could have been a case of home-ground biased judges. It is not correct to dethrone a Champion like that. Her team should appeal against the decision. Cathy dominated the fight and had a clear lead in majority (if not all) of the rounds. Is this Mariana Trejo related to Dan Trejo the “machete” if that’s the case cathy can surely lose, but she has spoiled my Sunday. What time was the fight…any video recorded,can’t wait to watch it…. We can’t blame Catherine as this was predicted from the start. When you have an illegal government that is failing its people in all areas of life you cannot surely expect the same people to effectively represent the country. The quicker we get rid of failures like lungu the better. George here is a logical example. Say you are father who is a failure in life and everything you do you fail at it. The only achievement is something that you corruptly gained. Meanwhile your kid looks upto you and learns from you. Now should the kid go onto fail who would you blame? The defence match was supposed to be in Zambia…. White pigs are a problem. Keep fighting young girl, these things happen, you win some and lose some just like your opponent’s record says. We are proud of you and will support you to the hilt. And by the way, just ignore the UPNDonkeys, they don’t like easterners at all no matter what nice things they say to you. I am not kidding, HH himself made it clear that he does not like easterners by targeting Chief Justice Mambilima and ECZ Chairman Esau Chulu simply for being easterners. Deny it NEZ and your fellow donkeys, didn’t you and chief donkey hh describe easterners as corrupt finkubala eaters? Even bemba are in the same boat when donkeys meet in their inner circles which exclude GBM. I am one of those who raised from rags to riches.. My mum was not educated BUT she encouraged me to purse education seriously. Catherine. You can do better than that. Hope is not lost. Rise up and win again. That lose is is just to strengthen you. Go for it.